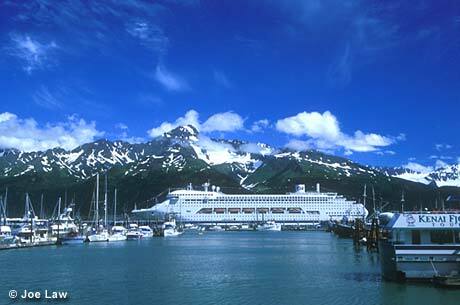 Seward is one of the Alaskan ports for the cruise ships that bring travelers from the "Lower 48." Southeast on the coast of the Kenai Peninsula and Resurrection Bay, Seward is graced with high mountain slopes that form an impressive backdrop for the city. In Seward you can enjoy bird viewing, biking, fishing, glacier viewing, hiking, skiing, sightseeing, sea kayaking and snow machining.